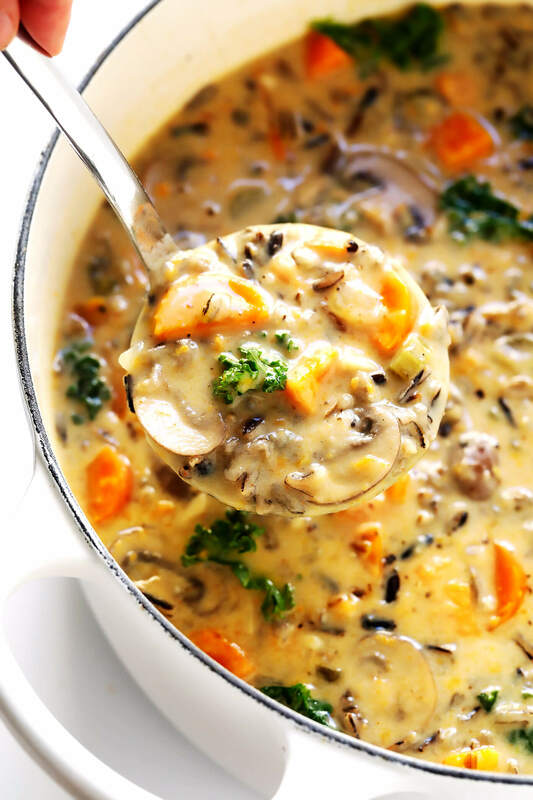 This Cozy Autumn Wild Rice Soup is full of hearty seasonal vegetables and wild rice (plus chicken, if you would like), it’s wonderfully creamy and comforting, and easy to make in the Instant Pot, Crock-Pot or on the stovetop. For those days when you’re craving a cozy, creamy, comforting bowl of soup…I have the perfect new recipe for you. It’s a riff on the classic chicken and wild rice soup of my childhood. But in lieu of the chicken (which you’re still welcome to add if you’d like), I’ve loaded this soup up instead with lots and lots of seasonal veggies. And added in some bolder savory seasonings. And lightened it up a bit by using milk instead of heavy cream. And the result? Plus, more good news! It’s easy to make in either the Instant Pot (pressure cooker), Crock-Pot (slow cooker), or on the stovetop — your choice. And you can adapt the recipe to be gluten-free and/or vegan, if you prefer. Options, options. So if you’re ready to cozy up with a warm bowl of soup yourself, load up a shopping bag full of veggies and wild rice, and let’s make some together. Wild Rice: I used and loved 100% wild rice (affiliate link) in this recipe, not a wild rice blend. Vegetable Stock: Or chicken stock, whatever you happen to have on hand. Autumn Veggies: Sweet potato, carrots, celery, onion, baby bella mushrooms and garlic. The Cream Sauce: Made from butter, flour and milk, which we will mix up at the end of the cooking time. Or see options below for a gluten-free and/or vegan alternative. Kale: I also added in lots of fresh kale at the end, or you could sub in baby spinach or collard greens. Salt & Pepper: Don’t forget ’em! Cook the base of the soup: Whichever cooking method you choose, we will simmer the base soup ingredients (veggies, rice, broth, seasonings) until the rice is cooked and tender. Add chicken: You can either add pre-cooked/shredded chicken. Or add a chicken breast (or two) to the pot and let it cook along with the rice and veggies, then remove and shred it once it has cooked through. 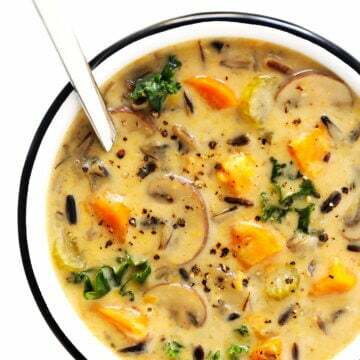 Add more veggies: There are so many other veggies that would be great in this soup too, like cauliflower, butternut squash, parsnips, bell peppers…whatever sounds good! Make it gluten-free: Feel free to use the vegan option below (it’s delicious!). Or skip the roux (the butter/flour step) for the cream sauce, and just whisk 1.5 tablespoons gluten-free cornstarch into a saucepan of cold milk. Heat the milk until it just barely reaches a simmer, whisking frequently, and the milk will thicken up. Then add it to the soup. As always, be sure to check that all of your other ingredients are certified gluten-free. 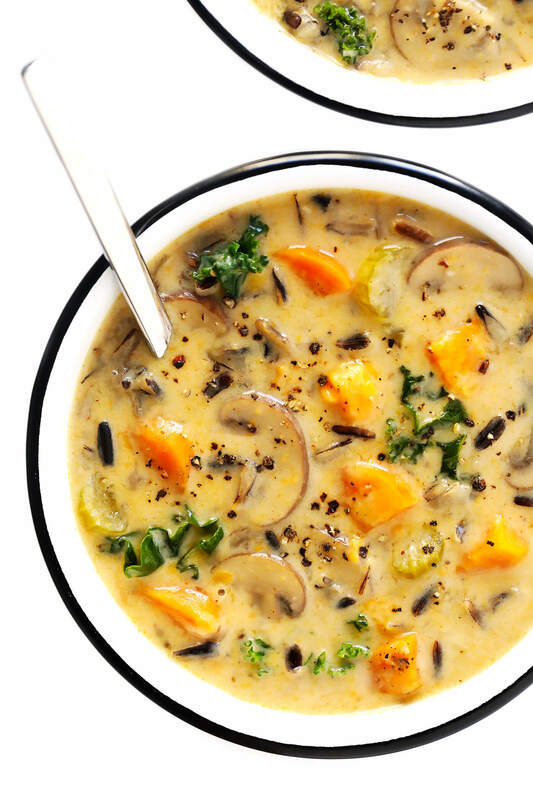 Make it vegan: Skip the cream sauce altogether and add in 1 (15-ounce) can of full-fat coconut milk instead. To be honest, I love the coconut milk version even more than the dairy! Crusty bread or oyster crackers: Or my Healthy Pumpkin Muffins (also gluten-free). A big, fresh green salad: Such as my Everyday Salad or My Favorite Apple Spinach Salad. Autumn dessert: Such as Pumpkin Cookies or my favorite Healthy Peanut Butter Cookies. Hope you enjoy this one, friends! 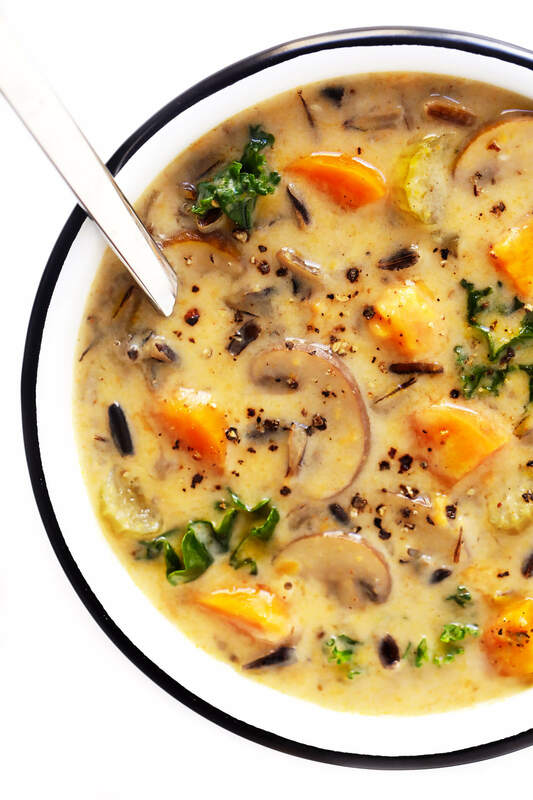 This Cozy Autumn Wild Rice Soup is wonderfully creamy and comforting. See tips above for how to modify this recipe to be gluten-free and/or vegan, if you prefer. 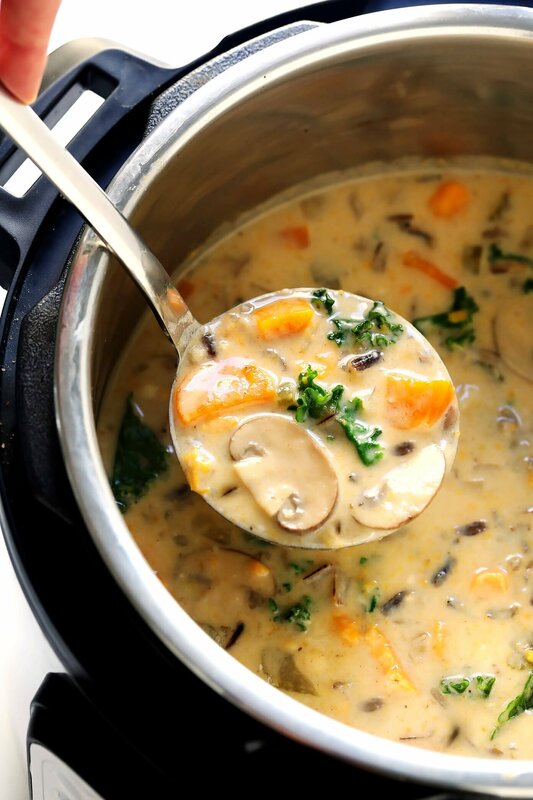 Combine vegetable stock, wild rice, mushrooms, garlic, carrots, celery, sweet potato, onion, bay leaf and Old Bay seasoning in the bowl of an Instant Pot pressure cooker. Stir briefly to combine. Cover and set vent to “sealing”. Cook on manual (high pressure) for 25 minutes. Let the Instant Pot rest there for an extra 10 minutes (natural release). Then carefully turn the vent to “venting” and release the remaining pressure (quick release). Remove lid and discard the bay leaf. Add the cream sauce and kale to the soup, and stir gently until combined. Taste and season with salt and pepper (plus any extra Old Bay seasoning, if you would like) as needed. Serve warm. Or transfer to sealed container(s) and refrigerate for up to 4 days. 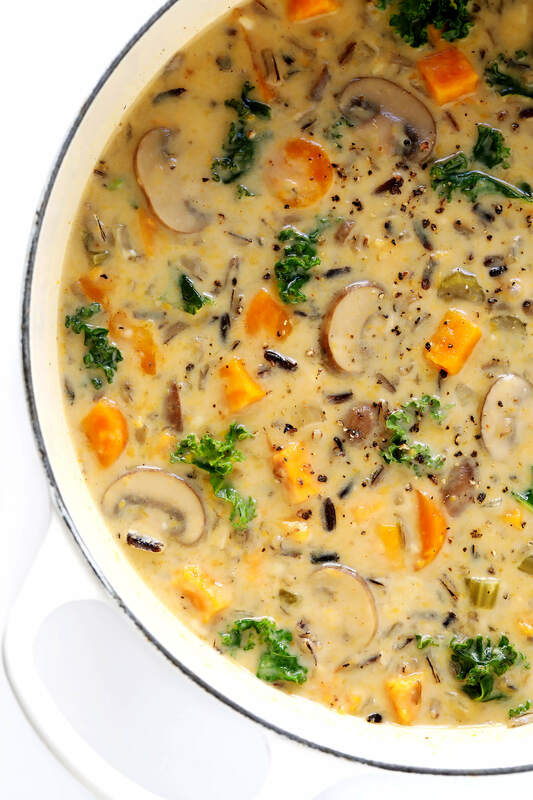 Combine vegetable stock, wild rice, mushrooms, garlic, carrots, celery, sweet potato, onion, bay leaf and Old Bay seasoning in the bowl of a large slow cooker. Stir briefly to combine. Cook on high for 4 hours or on low for 8 hours, until the rice is cooked and tender. Heat (an extra) 1 tablespoon butter in a large stockpot over medium-high heat. Add onion and sauté for 5 minutes, stirring occasionally, until soft and translucent. Stir in the garlic and cook for an additional 1-2 minutes, stirring occasionally, until fragrant. Add in the vegetable stock, wild rice, mushrooms, carrots, celery, sweet potato, bay leaf and Old Bay seasoning. Stir to combine. Continue cooking until the soup reaches a simmer. Then reduce heat to medium-low, cover and simmer for 45 minutes, or until the rice is tender, stirring occasionally. *As mentioned above, if you would like to skip making the cream sauce (butter, flour, milk), feel free to just add in a can of full-fat coconut milk instead. It’s dairy-free and vegan, and absolutely delicious in this recipe! 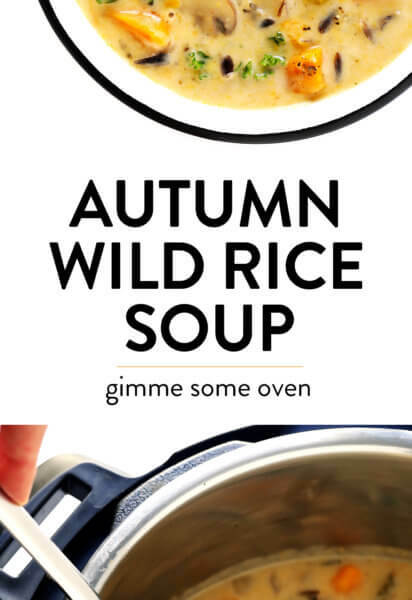 *I used 100% wild rice (not a blend), which I love and recommend for this soup. Cooking time may vary if you use a wild rice blend. *Recipe edited from the original to make the milk/butter roux slightly less thick, per reader requests. Enjoy! This post uses Amazon affiliate links. Best recipe!! Thank you so much for posting the instant pot, crockpot, and stove top directions. Fantastic! Made with coconut milk, a little less old bay and chicken/chicken broth. Also added a little turmeric. Best soup ever and my 2 year old loves it! This is awesome! I added vegetable and chicken stock. Added half of a chopped green bell pepper. Also, used 2 boxes of the Rice A Roni Long grain & wild rice adding the seasoning packets. That took the flavor to another level. Used fat free half and half instead of milk. Added diced chicken and italian chicken meatballs. Wow, it was scrumptious!!! 5 ☆ ALL THE WAY! This soup is so delicious! Best soup recipe I’ve found in a LONG time! Went with canned coconut milk and Garlic and Herb Old Bay Seasoning, only 1T. Had wild rice leftover in the fridge, added it at the end. Used electric pressure cooker 12 minutes on High pressure, since the rice had been cooked separately. 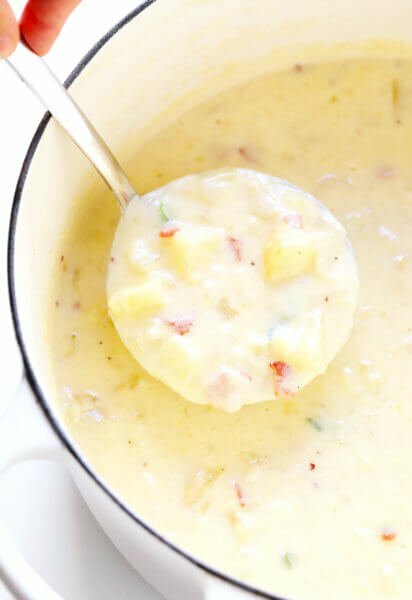 The flavors in this soup are amazing and it leaves you craving more!!! Everyone who ate it LOVED it, adults and kids alike! Can’t thank you enough for this recipe! Oh yea! It was very good! The only thing I substituted was gluten free flour for the thickener. Thank you so much! I love this soup!!! I made it vegan with the coconut milk and it was perfect. I used the stovetop method and I would like to do that again but I need to transport it to a gathering in a Crock-Pot and possibly leave it on warm or low for a couple hours. Any thoughts on if that would overcook the rice or if too much broth would get absorbed? Thank you! Loved it! I usually don’t LOVE soup, but this one was better than just soup. I used the coconut milk option to make it dairy free but even if you aren’t dairy free, I highly recommend it! I wasn’t sure about the Old Bay, but it all went together so well. Fantastic soup. Quick, easy and delicious. Used beef broth and coconut milk and it was full of flavour. The wild rice was the key to an interesting nutty taste. LOVE this soup! I used coconut milk and it is perfect, I was worried it would be too coconut forward but it’s not. Instead of Old Bay, I used Tony’s Creole seasoning as well as italian seasoning and added a ton of diff veggies. Delicious and will be making again! The best hearty winter soup. I make this about once a week. The kids love it. 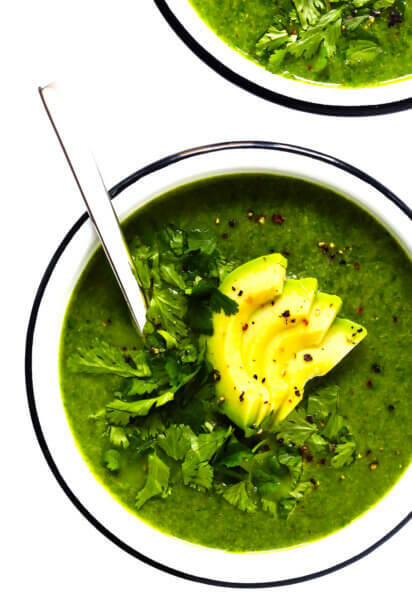 I LOVE, LOVE, LOVE this Soup. Thanks for sharing it. Thanks for a delicious soup recipe! This is exactly what I was in the mood for. I followed the recipe exactly with the exception of the Old Bay seasoning. Since I didn’t have any on hand I used a generous pinch each of smoked paprika, black pepper, dried mustard, and cayenne pepper and a not-so-generous pinch each of cinnamon, allspice, ginger, and nutmeg. So good! I will definitely be making this one again. This soup is amaze every time I make it. I’ve sent the recipe to a bazillion people and my husband requests it on the regular. Perfect for autumn, winter, spring…! Does anyone know how many calories this soup is by any chance? This is a delicious and hearty soup. I will make it again. LOVED THIS SOUP!! does anyone know nutritional breakdown so I can track on MyFitnessPal? I made this recipe a few days ago and I must say it is amazing! I made the vegan version with coconut milk, added spinach as well as kale, added even more mushrooms and used quinoa because I don’t like rice. I ate this for lunch three days in a row and it tasted even better on the third day. This is now my favorite soup recipe and will be apart of my constant rotation. I read the comments and thought…nah, can’t be THAT good, but I’ll try it anyway. Well, it IS that good, even with a couple of substitutes – barley instead of wild rice because I didn’t have any, and home made spice blend (thank you internet for the recipe). This soup was absolutely delicious. I made it on the stovetop with no substitutions. It was filling too. Will definitely be a favorite in my house! Delicious. I added chilli flakes for a little more heat. Otherwise, followed the recipe for stove top cooking, using kale and Old Bay Seasonings. Was perfect for our Spring snow evening in Colorado!